This was no ordinary science fair. Students in the Joe Barnhart Academy took things a step further and created their own promotional videos for their projects. These were no ordinary videos though. Her experiment looked to determine just how much pressure a watermelon could take before exploding. Cue the YouTube videos of watermelons crushed by hundreds of rubber bands. On Wednesday afternoon, April 4, she was in the Moreno Junior High cafeteria with the other students explaining her project to parents and visitors. So how many rubber bands does it take? “1,244,” she said. She did learn a second lesson. Don’t take such a watermelon into the kitchen as those cracks formed during the experiment could cause a significantly greater explosion with much more time spent cleaning up. This was the first year for the academy to hold a science fair, and the digital aspect online was a natural fit. “Because we are a STEAM (science, technology, engineering, arts and math) academy, we definitely wanted to hit that technology aspect,” said Matt Ortega, science teacher. “We should have had an Oscar for the best video,” said Nneka McGee, instructional consultant. For these students, all of these experiments would be a challenge, but that is the purpose of the academy. 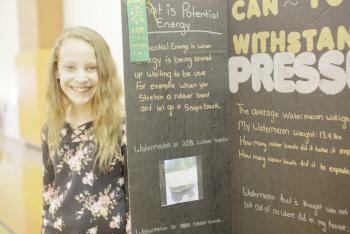 “A lot of our students had never done a science fair project before,” Ortega said. Their being a novice wasn’t noticeable in the projects as Ortega pointed out several as he walked around the fair. One such project, “Can You Hear Me Now?”, outlined just what it would take to build one’s own speakers. His experiment looked at the various types of blades used in windmills to determine which would be the most efficient at producing power. This type of project is just one being done at the academy. Ortega said that they teach students differently there. A simple question, he said, might require the answer be given in interpretive dance, through painting or even through music.